Milled false bottom , at the bottom of false bottom with anti flushing water device, Wort collection pipes; Retractable rakes, can be lifted up and down, can be hooked and unhooked during the process of retraction; Bottom spent grain door; Stainless steel legs with bigger and thicker base plate, with screw assembly to adjust leg height; Complete with associated valves and fittings. Boiler/Whirlpool tank 200L Sanitary Stainless steel 304, Effective volume: 200L; Surface brushed, welding line polish sanding light belt; Steam jacket; Polyurethane insulation, thickness: 80mm; Inner body thickness 3mm, cladding thickness 2mm; Top glass Man-hole door; With sight light; With rotary CIP spray balls; Tangential whirlpool entry; Stainless steel legs with bigger and thicker base plate , with screw assembly to adjust leg height; Complete with associated valves and fittings. Fermentation Tank 200L Sanitary Stainless steel 304, conical vertical tank , Effective capacity: 200L; dome top head; Surface brushed, welding line polish sanding light belt; Polyurethane insulation, thickness: 80mm; inner body thickness 3mm, cladding thickness 2mm; Dimple type glycol cooling jacket, cooling jacket thickness is 1.5mm; Top breather valve; Side manhole; With rotary CIP spray balls and arm; temperature sensor on bottom cone side cylinder slightly top position, Sample valve in the cylinder; separate outlet for yeast and clear beer, the clear beer outlet located in the conical part of the tank, ladders, Mechanical pressure valve; Pressure gauge; Glycol solenoid valves, with screw assembly to adjust leg height; Complete with associated valves and fittings. 6.Brewery Detail 7. Options Q1 Can your brewery system make both lager and ale9 A1 Yes. 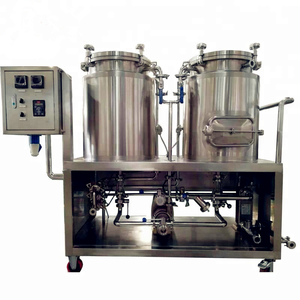 Q3 Is it possible to supply installation in my country9 A3 Yes, our engineers can go to your place and teach your person installation and brewing. We&rsquo;re sure your any inquiry or requirement will get prompt attention. 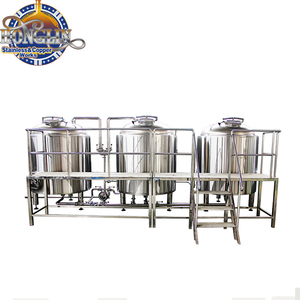 During the mashing system, the lauter tank and boiling kettle are vital important for the whole beer brewery equipment . 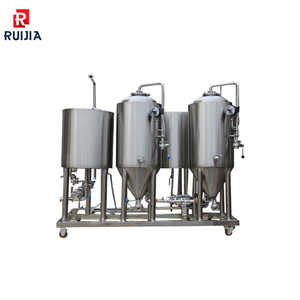 The numbers of fermentation tank is according to the beer brewery equipment daily output beer. This part play important roles in the whole set brewery equipment .